This installation was completed in August of 2018 and featured Synthetic Turf International product SoftLawn® Fresh Cut Pro. This product was used to complete the sizable 1700 sq. ft. project. What made this project interesting was that it was for a zoo’s flamingo exhibit! The new Flamingos exhibit can be viewed at the Turtle Back Zoo in West Orange, NJ. The only challenge Joe Nardolillo and his Tee to Green Landscaping/STI of New Jersey team faced during the installation was working around the many different contractors in order to complete the job in a timely manner. 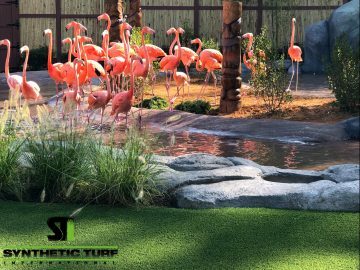 Now the flamingos can enjoy a beautiful, clean environment for their new home. Completed by Tee to Green landscaping/STI of N.J.